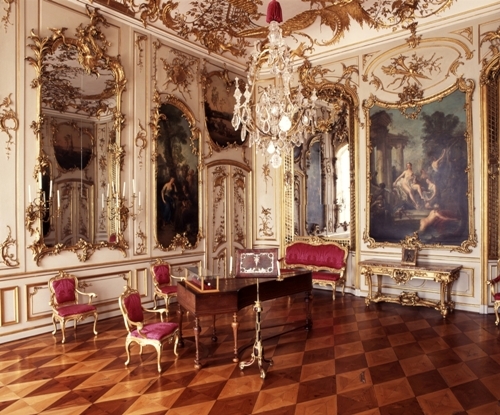 Potsdam, Schloss Sanssouci, Konzertzimmer, view of harpsichord and music stand. Photographer: SPSG. © Stiftung Preußische Schlösser und Gärten Berlin-Brandenburg/SPSG. (source: letter of Wilhelmine to her brother Frederick, Bayreuth 29 January 1736). (source: letter of Frederick II to Wilhelmine, Rheinsberg 23 November 1738). 1. “At that time (1752) the Berlin Orchestra was the most brilliant one in Europa. Famous men such as Bach, Benda, Czarth, Graun, Hesse, Quantz and Richter were among the musicians.” (1772). ..ssd.ssd2. “The figure of this veteran musician is of an uncommon size. The son of Hercules he justly seems, by his broad shoulders and gigantic limbs; and he appears to enjoy an uncommon portion of health and vigour, for a person arrived at his seventy-sixth year.” (1772). 3. “In 1727 he (Quantz) arrived in London where he found the opera in a very flourishing state, under the direction of Handel. The drama of Admetus was now in run, of which, he says, the music was grand and pompous.” (Berlin October 2, 1772). 5. Vinci, Pergolese, Leo, Feo, Handel and may others, who flourished in the best times of Graun and Quantz, I think superior of them in taste and genius. Of his majesty’s two favourites, the one is languid, and the other frequently common and insipid, and yet their names are religion in Berlin and more sworn by, then those of Luther and Calvin. (Berlin October 5-9, 1772). 6. “Quantz bore no other part in the performance of the concertos of tonight than to give the time with the motion of his hand, at the beginning of each movement, except now and then to cry “bravo” to his royal scholar, at the end of the solo parts and closes; which seems to be a privilage allowed to no other musician of the band.” (1772).